It’s been a while since I’ve posted progress on replacing the childrens songs in my son’s toy record player with full albums. Many who have seen it have asked to see schematics and code. When I get more time, I’ll post another video. This code is running on an Arduino Uno. On the SD card I have named each track sequentially: track001.mp3, track002.mp3 etc.. Regarding nomenclature, tracks are not separated by albums. Instead, records is an array with each element containing the number of tracks in each album. needle is an array of inputs from the needle head (analog pins A0-A3) that I treat as binary and convert to decimal using the bit() function. This is how I map physical records to a particular set of mp3 tracks. It calculates what track to start on depending on how many tracks are in each album. So for example track012.mp3 starts the first track in the ‘Who’ album, which has a decimal equivalent of 6 represented in binary by the buttons on the physical player’s needle. The physical record has grooves that push down on the buttons on the needle (see video in last post). 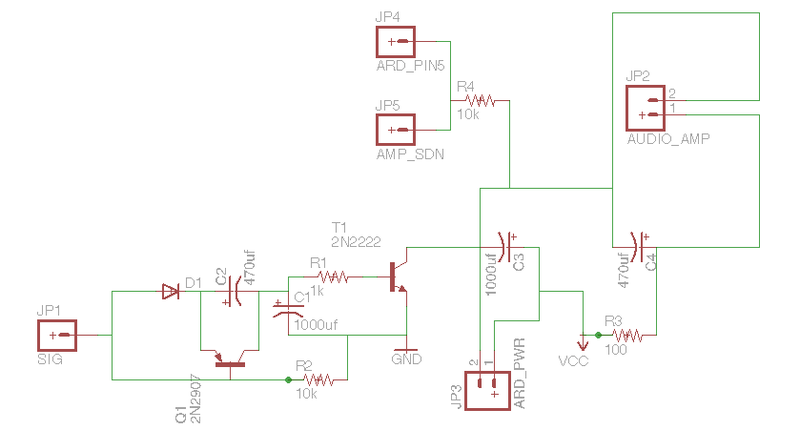 I use speaker_onoff to turn off / on an opamp to stop an annoying click that I encountered when changing tracks.. There is a physical pull down resistor (see schematic) to keep it off by default and pull it high with the controller only after it starts playing. // Pick a random track in the album and play it.